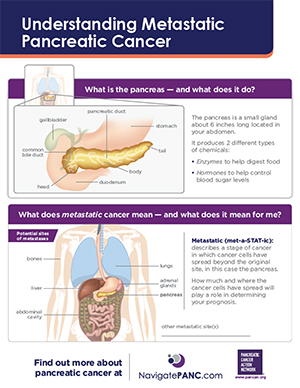 Common treatment options for pancreatic cancer can include surgery, chemotherapy, and radiation therapy. In some cases, treatment options may include ablation, embolization, or complementary therapies. Together, you and your healthcare team will create an individualized treatment plan based on many factors, including the pancreatic cancer’s stage and your overall health. These treatments may be used separately or in combination. They may be used at different times. All treatments have both potential benefits and risks. It’s important to discuss these with your healthcare team. Depending on a patient’s situation at a particular point in time, a treatment may range from surgery, which can be potentially curative, to palliative. For example, surgery to remove a tumor might be considered curative. Surgery to insert a stent, in order to alleviate a patient’s discomfort and symptoms, might be considered palliative.